Includes these 7 short stories:Between Utopias by Michael TrimmerForbidden Future by James WymoreJump by Jon BradburySociety by Terra HarmonyRoad Trip by Matt MitrovichCacotopia by James LaurenThe Mountains Haven't by Kade AndersonMy review:Overall, my review is 4 stars because there is some good stuff here and all stories are well-written and worth the read. I've highlighted a few of the stories below.Forbidden Futureby James WymoreIf you had nothing left to lose, what would you do?Andrew O'Brien, night watchman and head janitor of a time machine, is having a hell of a night. His shift starts off horribly with a less than pleasant phone call from his wife and the news of budget cuts. He worries about losing his position as Chief Custodial Engineer. Then, he is served divorce papers. A man on the edge, he does the unthinkable. He goes time traveling.I liked this story. Not everybody gets a happily-ever-after and I am okay with that. It was well written and had good flow.Excerpt:With a little luck, the future would be better. It wasn't his lucky day, but maybe he could change his fortune by changing his destiny. Maybe it would be so amazing that he'd never have any reason to come back.After a decade of loyal service, he was finally taking a turn in the machine he had cared for every night.Cacotopiaby James LaurenEven money won't save you from all perils.When too rich for his own good Kayne Adamson wakes up from hibernation, it can only mean one thing. A cure for his brain tumor must have been discovered. His euphoria is short lived when he learns he is in the city of Panera. Something is amiss.Ick. The cult-like atmosphere of Panera will have me shunning all utopias. There is no such thing as perfect. Yet, my idea of perfect probably won't agree with yours. Cacotopia is an enjoyable read, made me think way too much.Excerpt:Kayne's head buzzed as he digested what Dareios told him. Eight hundred years. Eight hundred years. The rest didn't matter. Simone, Emily, and Josh were gone from him forever. He had hoped he would be revived after a few years, a decade or two at the most, to see them again and live out the rest of his days in the bosom of his family.Eight hundred years. The enormity of those years threatened to crush him.The Mountains Haven'tby Kade AndersonThings are not as they seem in the small town of Dignity.Julia, the town's Watcher, knows something is amiss. One evening, she receives an ominous note along with two journals. She leaves town to find answers only to discover a truth she didn't see coming. Everything is explained to her, the reason for mysterious disappearances and lapses in time.This is my favorite story in the Anthology. It is written journal-style, very appealing to me. My only complaint is that I want more.Excerpt:Day 5It's another dust-filled day. Just like yesterday, and the day before that, and the day before that. The weather never seems to change here in Dignity.Dignity. What a stupid name for a town. It's like naming a kid after a virtue; it sounds real pretty but only ensures that it's the last trait that kid will ever develop. As a kid, I used to walk to school every morning with a girl named Chastity. She's got five kids now and still no man. Dignity is like that - nobody here has any left. It's a hard thing to hold on to when you're trying to hold onto life. (On my blog, this actually got a 3.5 rating. )”Between Utopias” by Michael Trimmer: This story wasn’t uninteresting, but felt lacking in enough originality to really stand out to me. The character wasn’t particularly sympathetic, although perhaps relatable. It had a couple interesting aspects, though. 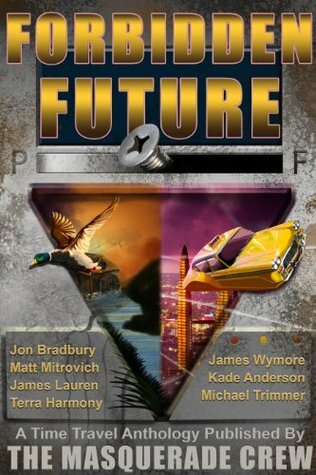 A bit better editing and streamlining would’ve helped earlier in the prose to make it feel less muddled.“Forbidden Future” by James Wymore: Again, interesting but without that unique flair to really make it stand out. Although I did find it particularly interesting that it spent less time on the details of the future and more on the cycles inherent in the story. Again, though, despite the circumstances, I didn’t find enough to make the main character particularly sympathetic.“Jump” by Jon Bradbury: This one caught my attention better because it presented what I found was a more original angle, at least comparatively: Jesse’s job and the reason for his time jump. Unfortunately, the plot felt a little too straight line; given the set-up, I’d expected a twist at the end but didn’t get that and was a little let down. Still, I found this story and character more engaging, even so.“Society” by Terra Harmony: This one I liked. Perhaps the first person narrative helped me anchor into the character more, but I just thought it gave me more to ground myself in both the story and narrator. I also liked that it started in the future, and had a less self-focused character leading into a slightly more…hopeful feeling at the end, despite the presented dystopia.“Road Trip” by Matt Mitrovich: This one amused me by the random cloud-based time travel, although I don’t think it was supposed to amuse me. The story wandered and the characters didn’t engage the reader much, but it was okay, and had a couple interesting points. Steve’s drive towards the end feels a little sudden, less organically shown/developed through the story, but the ending was interesting.“Cacotopia” by James Lauren: Harkening back to the first two, there was a rather unoriginal and predictable feeling to this one. But it still engaged me just enough to move through and feel something for the main character. And there was a certain…uncertainty in his “world view” right at the end of the story that I actually liked, since that one detail is not usually seen in these types of story.“The Mountains Haven’t” by Kade Anderson: This is my favorite. The journal format was good and the narrator very engaging. It was also, strangely, the only story out of seven that had a female main character. The “secret” of the mountains made for a very interesting angle, and a more original twist on the time travel idea than any of the other stories. It was a good one to end on. (Oh, and the cows thing amused me in a dark way. )Over all, this wasn’t a bad anthology although I didn’t find it great either. I only “really” liked a couple of the stories, but I didn’t dislike the rest. Time travel stories aren’t my usual read, so maybe there were subtle elements that I missed and am not giving the stories their due. I acknowledge this possibility.So for an average total, I give this 3.5 stars. It probably would’ve been a 3 (not great but not terrible), except for Anderson’s story. Which I really liked. Forbidden Future: A Time Traveler Anthology from Masquerade Publishing is a wonderful short story collection that takes seven slices at the mind-bending subject of time travel.While each story is an inventive little gem in itself, the title suggests a dark future, somewhere on a sliding scale between dystopia and bio-engineered ignorance.If you wonder why no one chooses to visit the past, check out the title story, Forbidden Future, by James Wymore, for one possible explanation. We meet O’Brien at the start of his shift as a night janitor for a government-funded time travel project. Middle-aged O’Brien’s life has settled into an uncomfortable routine: dead-end job, failing marriage and expanding waistline. His only solace is the nights he spends with his beloved time machine. Although the machine is capable of going into the future, this feature is blocked by the most mundane of objects — a screw drilled into the control panel. On the icy night when we meet hapless O’Brien, he is served with divorce papers and learns of budget cuts that threaten to take his job. With nothing to lose, he removes the screw and goes in search of a better future.Let’s just say things are never as bad as they seem in the present tense.On the other hand, if you don’t like your dystopian future, you can always come home again. You might even want to bring someone with you. In Society by Terra Harmony (is that a great name for a sci-fi writer, or what? ), we get to do just that. Author Harmony’s protagonist volunteers to travel forward in time to take dirt samples of a ecologically-failed world. While there he is picked up by a Society scouting mission screening the hordes of doomed humanity for healthy specimens. Only the healthy are allowed off-planet where they are subjected to an in-depth testing prior to being admitted to the Society. What happens if you don’t test out once you’ve been transported off the planet surface? You know the old saw: in space no one can hear you scream.In Jump by Jon Bradbury we get treated to a time-traveling cop on a mission to find his fiancee, Violet, who vanished without a trace the day before their wedding. Jesse, jilted groom and FBI Special Agent, has only one clue: the day she disappeared, she answered an ad to try to make some extra money. He finds more than he bargained for when he goes undercover.My favorite of the collection had to be The Mountains Haven’t by Kade Anderson. In the dueling voices of Julia and Eliza, we are taken to a world where past and present merge in “time loops” and ancestors become predecessors. I got so wrapped up in Anderson’s personalized voices that I did not see the ending coming.I love it when that happens. [Full disclosure: I have had a close working relationship with The Masquerade Crew and its leader, Mark Lee, for a year. I was going to become one of the editors of this anthology until circumstances not under my control interfered and I had to drop out. With that said, this review is, as always, honest. ]I’m not a big anthology reader, but I really did love this one. For one, I love science fiction and secondly I do love a good short story. And believe me, there are some awesome short stories in here.I’ll be totally predictable and say that my personal favourite was the anthology’s namesake: Forbidden Future. The main character was well-developed and interesting and the future he was thrust into was somewhat believable. And the ending was tragic and yet hilarious, but I can’t explain too much or that would spoil the awesome surprise. I won’t critique each short story, but on the whole I could relate to the characters and the futures were interesting. It’s hard to fit a whole new future into just a short story, but these authors were pretty awesome and managed to achieve it. Some futures were fantastic, others terrifying. There was a good balance in the selection of the stories because no two really predicted similar futures.The one thing I had a gripe with was the editing. This is The Masquerade Crew’s first anthology and some of the editing was, admittedly, a little rough. There were basic typographical errors that should have been caught and I’m hoping they’ll be corrected in any subsequent editions. I don’t think there were enough to really distract from the story, but they are there and they are noticeable.There’s a little something for everyone in Forbidden Future. There’s stories that get very technical for those fans of hard science fiction, but there’s also more character-driven stories for people like me who don’t necessarily understand a great deal of science. Yet in all the stories the main characters are interesting and characterization certainly wasn’t sacrificed in the world-building process. Each author had an unique voice and so did their characters.Overall I’m pretty happy with the anthology. It never really had a weak story that I just wanted to skip through; all of the stories here were pretty strong. I look forward to future anthologies by The Masquerade Crew.I give this book 4.5/5 stars, rounded up to 5 stars for Goodreads rating purposes. For more reviews, visit my blog: http://meanwhoyouare.blogspot.comThis anthology is filled with short bursts of adventure. Each story takes you on a quick catapult adventure which all involve choices and a trip to the future. Whether they were kidnapped or took a trip in a time travel machine. Between Utopias by Michael trimmer ~ 3.5/5I liked the message of the story - we always have a choice and even if we make the wrong choice, we can fix it by speaking up. There were a few grammar.editing errors. Forbidden Future by James Wymore ~ 3/5The message to me in this story was about choices and knowledge. Sometimes if someone has done something or they really advise against it - there is a very good reason for it!Society by Terra harmony ~ 5/5Society has the best writing and story line. The future is a scary place if we don't look after it. Road Trip by Matt Mitrovich ~ 4/5Road trip was the most fun story for me, but a little confusing at times. Cacotopia by James Lauren ~ 3/5Ignorance is bliss? Sometimes there is a fine line in this concept. The Mountains Haven't by Kade Anderson ~ 3/5This story was interesting to say the leas. I connected with the characters really easily.All in all this was a fun read full of adventures. Forbidden Future is a time-travel anthology published by Masquerade Publishing.I don’t want to focus on any one story in particular so this review is on the book as a whole. There were a couple of fantastic stories in this anthology, unfortunately there were also a couple that weren’t so great. So overall, I’m giving it three stars.The anthology is beautifully edited and formatted- read like a dream so no problems there. The stories stuck to the theme (so it did what it said on the box)- also fantastic. If a couple of the not-so-good stories had been replaced with others then this anthology would have gotten at least 4 stars, BUT don’t just take my word on it. What I didn’t enjoy other people will love, it’s all a matter of opinion.So, if you are looking for a few short reads in the time-travel genre I do recommend you pick up this anthology. I think time-travel stories are hard to pull off but these guys did a pretty good job: thumbs up all round. Kashif Ross James Wymore Jon Bradbury Matt Mitrovich James Lauren Terra Harmony Kade Anderson Michael Trimmer - For the past three years, Kashif Ross has been mainly known as a teacher. Yet, he's managed to pick up very random titles along the way. Previous jobs include Student Molecular Oncology Researcher, Camp Counselor, CGI Animator, Character Designer, and Professional Geek.Now he's an author living in California's Bay Area. You can find posts about his random thoughts and adventures on his blog.